Ghoomar Lyrics – Padmavat Movie Song: The first song from Sanjay Leela Bhansali’s controversial film Padmavati starring Deepika Padukone, Shahid Kapoor, Ranveer Singh and Aditi Rao Hydari. 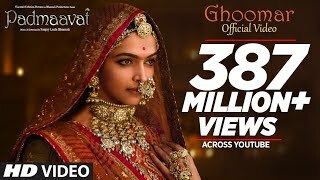 The song is an inspired version of Rajputana’s Royal folk song “Ghoomar”. The Padmavati film version of the song is sung by Shreya Ghoshal & Rajasthani singer Swaroop Khan under music direction of Sanjay Leela Bhansali while lyrics are penned by A M Turaz.